amazing. amazing! all the goodness of vintage little red riding hood and the total take after unstitching all the grotty curtain backing is about 6 amazing meters. i have no idea what i'm going to do with it, of course, but i'm sooooo happy to have it! 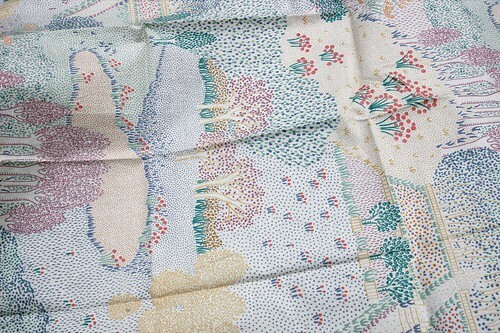 i also found this great piece, about two fat quarters worth, in a bundle of fabric for $2. i absolutely love it and it looks vaguely familiar to me - anyone out there know anything about who makes it? i'd love to order more... again, i don't know what for. this fabric stash is really getting out of hand. which brings me to my next point - i love thrift shopping. 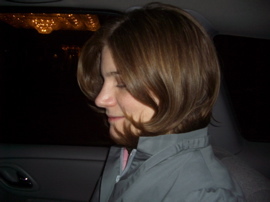 like, really love it and have for about 15 years now (god, how old am i??). i still get the same excitement as i head out and the same rush when i find something really amazing, really unique, really special. the reality is that for the past six months, since we moved into this house, i've managed to conveniently forget about the boxes (and boxes) of fabric and vintage treats that i have packed up in the shed and have continued to hit the local op shops like there's no tomorrow. i'm now having to face the fact that one doesn't need 30 mugs, no matter how cool they are, and that i probably already have more fabric than i could possibly hope to use in one lifetime. if i want to continue seeking out new treasures (and i do), i need to create a bit of a balance. i've decided that for every piece that comes into the house, another piece must go out and so, without further ado, i introduce you to my new little etsy shop, opening november 4.
it's a very timely opening, as we'll be moving things into the front rooms over the next two months and i'm sure to uncover a ton of delightful things that i've forgotten i'd even bought - as i did when i opened the trunk (boot, in aus) of my car last week to find some lovely pyrex and a working 1950s ceramic kettle! hopefully i won't find it too hard to initially cull my collection to a more reasonable level and some of you out there might find that perfect piece for your very own collection. Thanks for your lovely comment on my post about our upcoming trip...can't wait to hit H&M, Zara and of course all the local op-shops & craft stores. The op shop gods were EXTREMELY kind to you. The new "Finds" shop is a great idea, Leslie! Plus, the more you sell on Etsy, the more op-shop goodies you can buy later on! I still have a ton of fabric I should somehow get to you, but I guess we'll wait until the next time you come to Canada. I feel sure there are some treats in there you would really like! 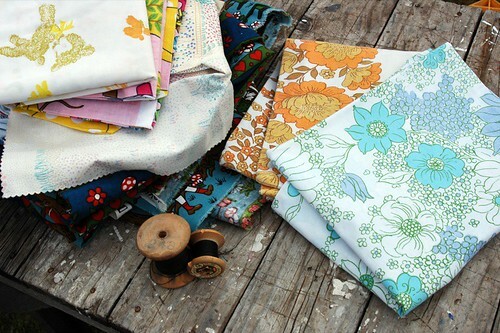 that fabric you're wondering about looks so very jill bliss, don't you think? what an awesome idea to open this new shop. i think that with your good taste, it's a safe bet that i'll be buying some of your finds! What great finds! You've really got the op-shopping mojo....I usually only encounter the dregs. And the new etsy shop is a fantastic idea! Share your finds with the rest of the crafty world and get some more dosh for more op-shopping. What a fabulous idea! I have been admiring so many of your thrift finds of late, maybe this will give me my chance to get my hands on some? Nice finds - you are very good at spotting great things! Well the Frugalling Fairy was definately with you on that trip! I'm with you on the etsy thing! Can't store any more! Some things are too precious to sell at Camberwell Market for 50 cents! next weekend, Bendigo, Here i come! 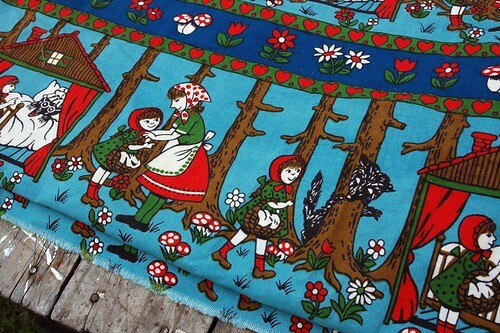 I couldn't believe it when I saw your 'Vintage Little red riding hood' fabric. A very dear family friend made all my sisters and I library bags using panels from that same fabric (over 30 years ago!) was a real blast to see it amongst your fantastic finds. The bags are still floating around the family home, if I can I'll post a photo! Great finds. How exciting (and very feng shui) that you are setting some of your finds "free" to have a (hopefully) puposeful life with someone else. I love it! I'm going to Bendigo for Easter weekend and have been promised dedicated op-shopping time by my very wise boyfriend. Any tips on the best oppies to hit, and where? I will probably have only 1-2 hours to shop (I'm on medication that makes me super sun-sensitive, so I can't stay out long), which is why I want to make sure I go to the very best treasure troves, if possible. Thanks! The colour is Poseidon from Bendigo Woollen mills. I am really loving Bendigo wool to knit with it is so lovely and hardly shows any inaccuracy in tension. Though I’d like to think I was becoming a better knitter, I think in reality Bendigo wool is just that good.